This time, I saw the color. You know when you see something that clicks, and because of that one thing, be it a picture, pillow, a mirror, you find yourself basing your entire design and vibe on that one wonderful thing. 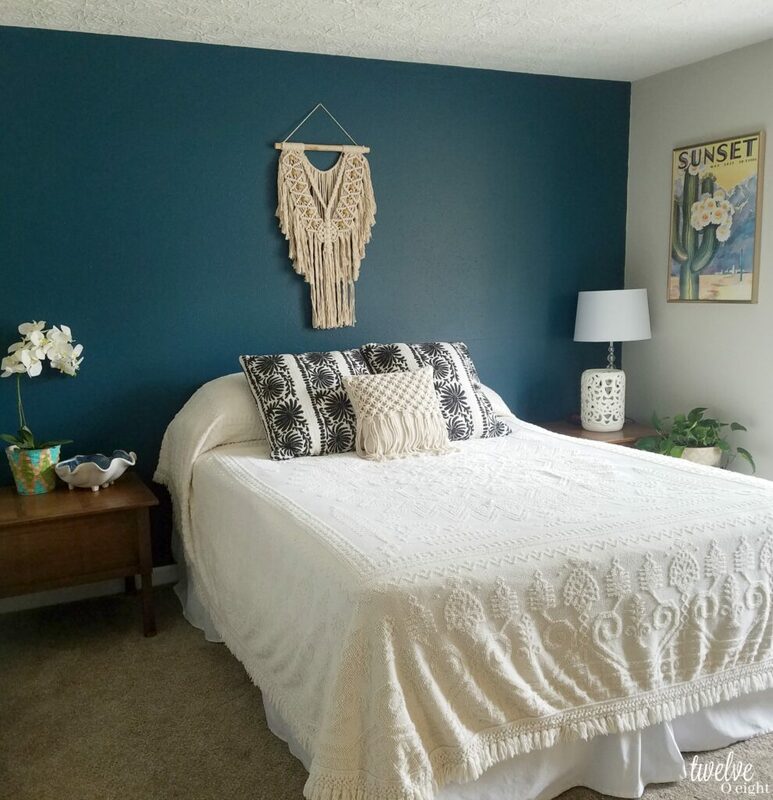 For me, it was the paint color that I fell head over heels for. 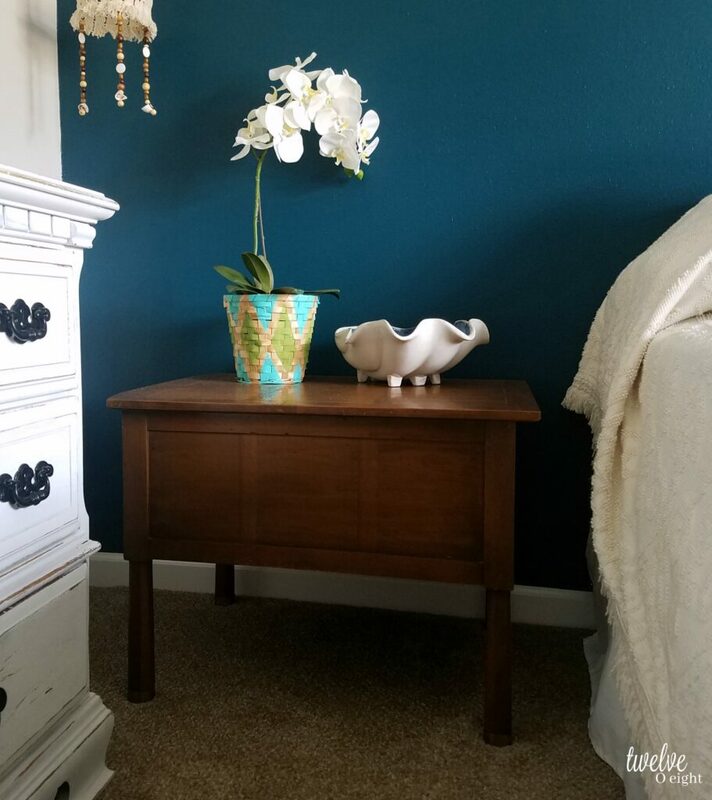 After choosing the color Ocean Abyss by Behr , I set out to find the first few things to bring the space together. I still need a rug, there is a wonky wall I am not sure what to do with, I don’t love the dresser in there. But I LOVE the wall and the bed so much, I can be patient (kind of) while the rest comes together. I was not compensated for this post, just really impressed with this paint. 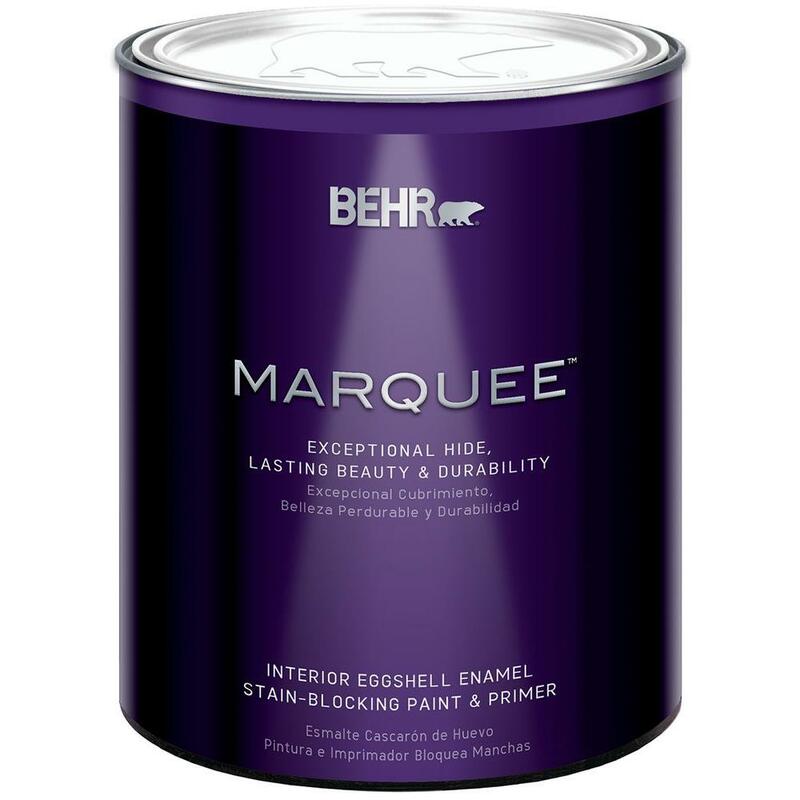 I have used Behr many times in the past, but this time chose the Marquee paint by Behr, and I have to say it is great paint. Even Penny agrees, look at her helping me there on my bed. She did look up for the photo from her comfy nap. Since I chose such a richly pigmented color I wanted to use a paint with excellent coverage. I could have probably gotten away with one coat, but painting over very pale grey I am loving the rich hue of two coats on our wall. 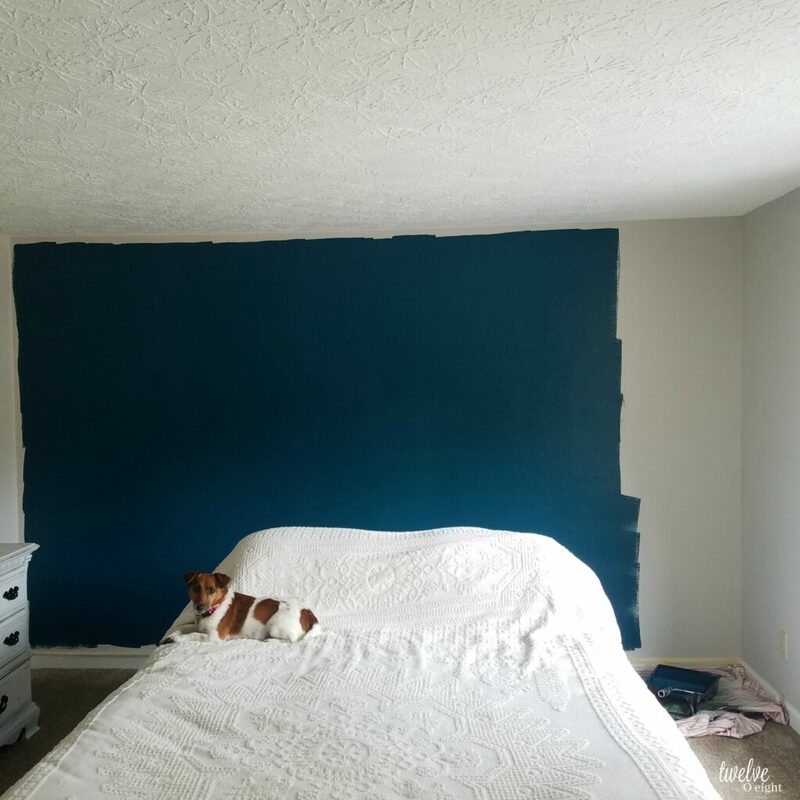 When I woke up the next morning I did a little happy dance and could not believe how much I love our progress in our new master bedroom. We have a ways to go, but I am loving how it’s already coming together. It is so funny how a house speaks to you, and how your style and taste just seems to evolve and change over time. There are always common threads don’t you think? 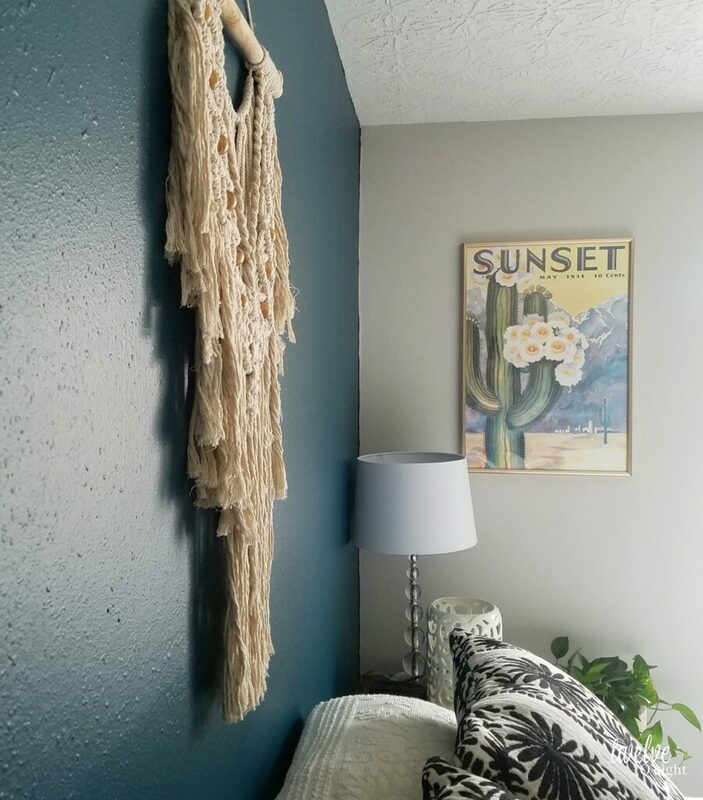 Like lots of texture, or a ton of vintage finds. But each time you have a style change, I don’t think it’s as much of a change as a reflection of the space we are in and the time in our life. I love it when someone visits our home and they see you in your home. The bedspread is a vintage score from Goodwill. I still cannot believe I found it in such good condition. The side tables were my Grandmother’s probably from the 1950’s-1960’s, she loved them and they flanked each side of our crushed gold davenport in our formal living room growing up. I could not part with them and I am so glad I have drug them around with me. The Sunset print is something I found already framed in a vintage shop locally. 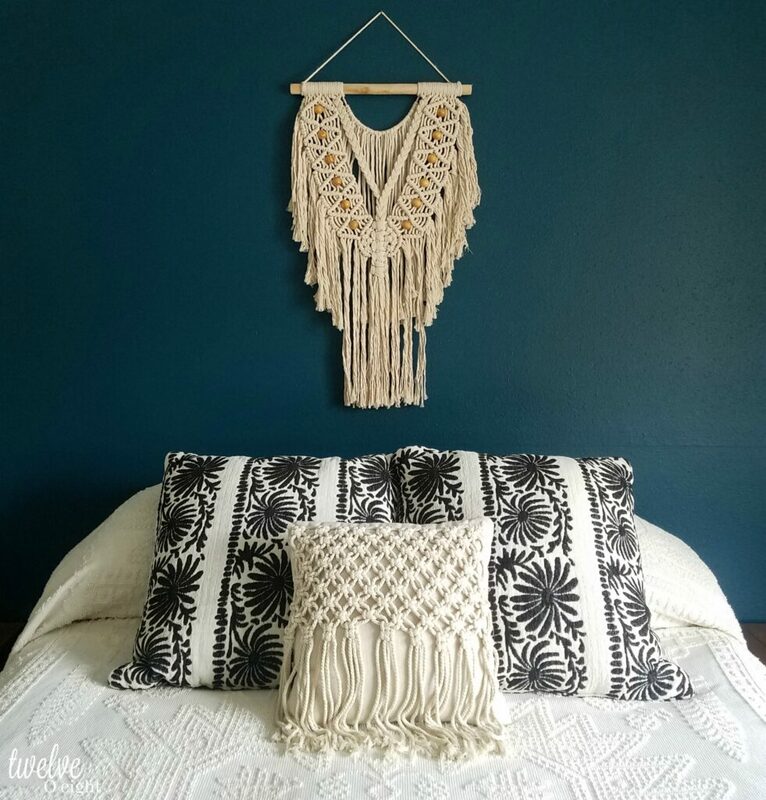 The macrame wall hanging a $20 find at Marshall’s. 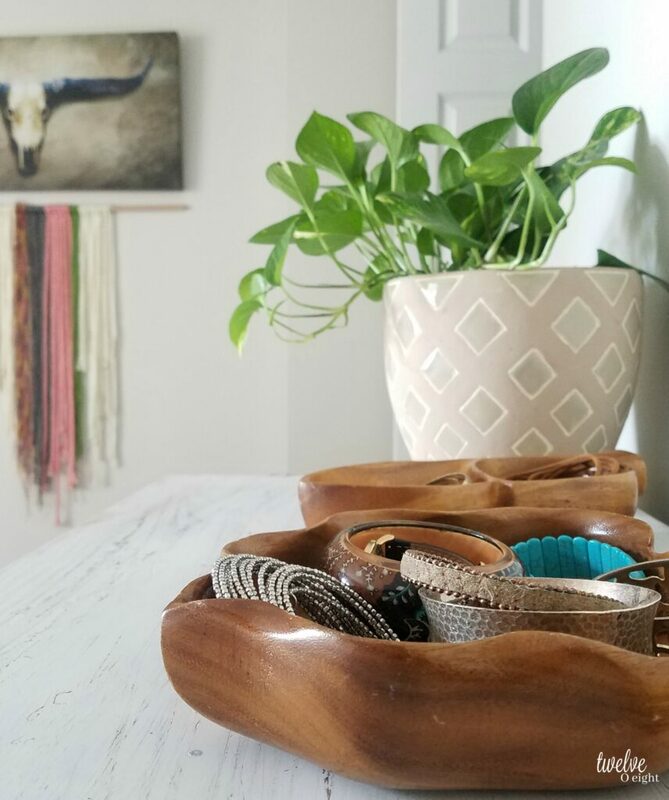 The wooden bowls for jewelry I have always loved and found two at a local thrift store, they are Monkeypod wood from Hawaii. While there are still things I am on the hunt for I am excited to see what we have been able to do so far. A throw for the end of the bed, and a few more pillows. We are heading for Seattle this next weekend so I am not sure how much we will accomplish at home, but it will undoubtedly include some shopping for treasures! So gorgeous Tanya! I can so relate on your happy dance, when something’s meant to be, it’s meant to be, like your beautiful wall and all the little treasures around it! Thank you so much Katrin! You are so sweet 🙂 Hugs! Students always wondering someone to do my assignment or my assignment help in Australia. Need not to worry more as we are one of the top assignment writing service provider.